The QSFP28 active electrical loopback is used for testing QSFP28 transceiver ports in board level test. 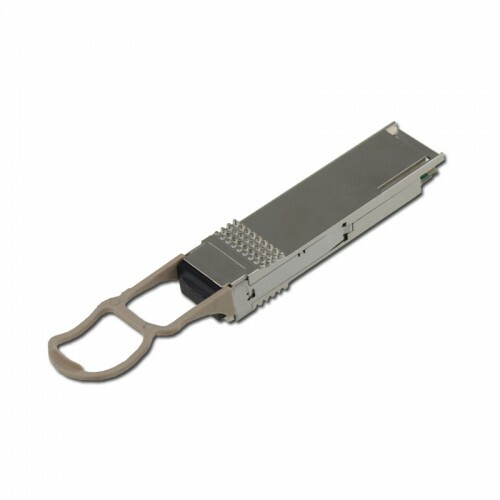 By substituting for a full-featured QSFP28 transceiver, the electrical loopback provides a cost effective low loss method for QSFP28 port testing. The GQS-MPO101-LP is packaged in a standard MSA housing compatible with all QSFP28 ports. Transmit data from the host is electrically routed (internal to the loopback module) to the receive data outputs and back to the host. Since the loopback module does not contain laser diodes, photodiodes, laser driver or transimpedance amplifier chips, etc., it provides an economical way to exercise QSFP28 ports during R&D validation, production testing and field testing. The GQS-MPO101-LP provides QSFP28 power Class 1, 2, 3, or 4 loading using a customer supplied +3.3V voltage supply. Power Classes 5, 6 and 7 are available upon request. This QSFP28-100G-LB is marked and labelled with Cablexa brand as default. Customized labelling and branding are available as request. Cablexa offers 5-year limited warranty on this QSFP28-100G-LB optical transceiver module. This Cablexa QSFP28 Active Electrical Loopback, 100Gbps Transceiver Module is 100% MSA compliant. It is guaranteed compatible with your router or switch. And it comes with a 5-year warranty and lifetime technical support. If you have any questions about this QSFP28-100G-LB transceiver module or any other item, feel free to contact us.